Zika No Longer Global Health Emergency, WHO Declares : Goats and Soda But it's too early to say whether the epidemic isn't as bad as the agency first predicted back in February. 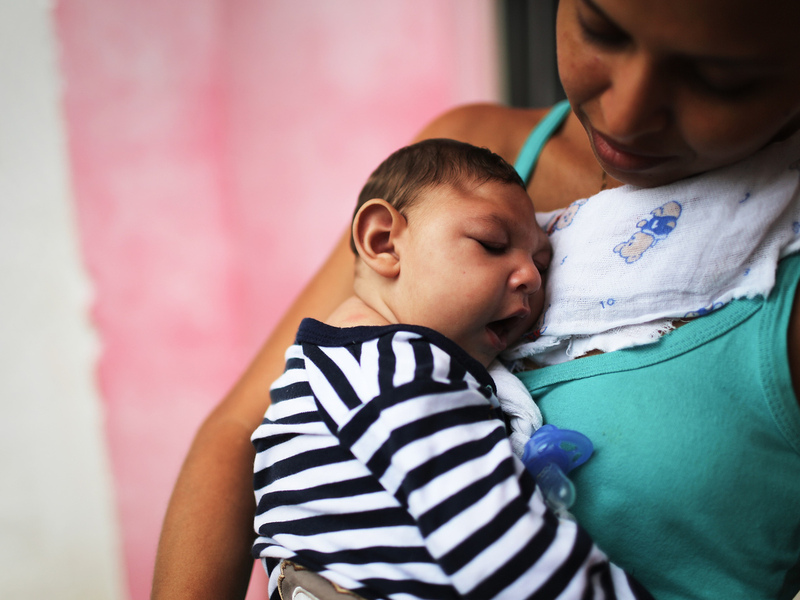 A mother holds her baby, who has microcephaly, in Recife, Brazil. The World Health Organization announced Friday that it no longer considers the Zika epidemic a public health emergency of international concern. But Zika's threat to pregnant women and babies is not going away anytime soon, the agency says. Instead, the virus is now a chronic problem, says the WHO's Dr. Pete Salama. "It is really important that we communicate this very clearly: We are not downgrading the importance of Zika," Salama says. "In fact, by placing this as a longer term program of work, we're sending the message that Zika is here to stay. And WHO's response is here to stay, in a robust manner." One thing is clear: Zika is still spreading. And microcephaly cases are still growing. Argentina reported its first potential case this week. And Florida continues to find people who caught Zika inside the state. For these reasons, pregnant women — and their partners — still need to pay attention to where they travel, says Dr. Thomas Frieden, director of the Centers for Disease Control and Prevention. "Regardless of how WHO defines Zika, [the disease] is unprecedented, and it's an extraordinary risk for pregnant women," Frieden says. "That's why it's important that pregnant women not travel to places where Zika is spreading." Right now, those places include countries across Latin America, the Caribbean, parts of Southeast Asia — and neighborhoods in Miami. WHO first declared Zika a public health emergency back in February. Back then, the situation looked dire. Brazil was investigating more than 4,000 cases of microcephaly — a horrible birth defect where babies have brain damage and small heads. And health officials were predicting thousands of more cases, as Zika spread across the Western Hemisphere. "If this pattern is confirmed beyond Latin America and the Caribbean, the world will face a severe public health crisis," WHO's director-general, Dr. Margaret Chan, said in February. But so far, that pattern hasn't repeated itself. Brazil has confirmed the most Zika-linked microcephaly cases, about 2,100. Other counties in Latin America have reported far fewer. Colombia has the second highest with 57 confirmed cases and the U.S. is third with 31, WHO said Thursday. Such a vast difference between the situation in Brazil versus other countries has raised some eyebrows. Could some other factor in Brazil be increasing the risk of microcephaly there? Perhaps a pesticide or another virus? "I think it's too early to draw conclusions," says Alessandro Vespignani, who models the spread of Zika virus at Northeastern University in Boston. Colombia is still investigating more than 300 microcephaly cases to see if they're linked to Zika. Several countries, such as Venezuela and Haiti, have not been vigilant about reporting cases. And countries that are on top of reporting, such as Mexico and Puerto Rico, aren't expected to have microcephaly cases until next year — it takes around 9 months after a Zika outbreak strikes for the bulk of microcephaly cases to appear. "We can't rule out the possibility that something unique is happening in Brazil," Vespignani says. "But, right now, we have to wait and see what happens elsewhere."